Any time a member of your family is struggling with an extended illness that forces the adults to come together to offer their support, kids can feel a bit left out in the cold. When faced with the necessity of sharing some of your attention and what seems to be no real way to contribute, kids can be confused and scared about what will happen to someone they love. One of the most effective ways of helping a child to cope with the serious illness of someone close to her is to make her feel like an integral part of the support network. Before you attempt to shield your child from the realities of a serious illness, consider the ways that she can be a real help and learn to understand sickness at the same time. 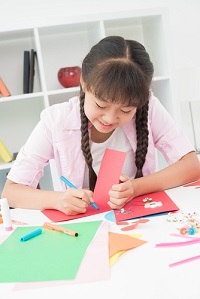 Few things brighten an adult’s day like a handmade card or a handwritten letter from a child whom they love. This especially holds true when they’re struggling with a serious illness. Encouraging kids to write letters is not only a great way to help them show support for their family members during a difficult time, but can also help them gain the skills necessary to write an actual, handwritten letter in a world that increasingly relies upon emails and text messaging. When a relative’s illness is so severe that visitors aren’t recommended, or their physical appearance has deteriorated as a result of their illness to the point of being scary or uncomfortable for kids to see, these little mementos serve as a powerful reminder of their love and affection. Pets need to be fed, watered, walked and looked after, even when their owner is struggling to overcome or manage a serious illness. Kids who aren’t quite comfortable getting actively involved in the sickroom or who aren’t old enough to properly manage the intricacies of medical assistance may be more than mature enough to assist with the care and feeding of family pets. Encourage your child to get involved with the pets living in a sick relative’s household, even if the family member is currently hospitalized or incapacitated. Even kids that are reluctant to contribute to the running of their own household tend to be more than generous when it comes to pitching in to help a sick family member. While you may not want to trust your kindergartener with dusting the fine china or managing the laundry, she’s still perfectly capable of helping to dust, sweep and complete light household chores. When it comes to showing support, love and concern for an ailing loved one, few things make more of a difference than a good, old-fashioned, in-the-flesh visit. That being said, it’s not always wise to expose kids to a relative whose appearance has changed dramatically for the worse after battling with a long illness. You also won’t want to expose little ones to anyone who’s fighting an infectious disease. Use your own better judgment to determine whether or not a visit from your child would be appropriate. While it’s one of the most unpleasant and upsetting aspects of life, illness and even death are inevitable and kids simply can’t be shielded from them forever. Depending on your child’s age and maturity level, you may find that a frank and honest conversation about her relative’s sickness, the severity of the illness and her loved one’s likelihood of survival is in order. Kids have a way of asking very blunt and direct questions, and don’t tend to shy away from wondering out loud whether or not someone is going to die. Rather than worrying that your child is callous or inconsiderate, realize that the concept of death is still quite vague and mysterious for many kids, especially if they’ve never experienced the passing of someone they knew. Taking the opportunity to explain your family’s belief system and faith regarding the cycle of life may force you to handle the matter earlier than you would have liked, but it’s important to remember that kids simply can’t be sheltered from such incontrovertible truths forever.